Likes: Mario, Peach, Toadette, racing, tennis, baseball and other sports. Dislikes: All enemies, especially Bowser. Toad’s quiet life as one of Princess Toadstool’s loyal servants was changed forever the day Bowser descended on the Mushroom Kingdom. 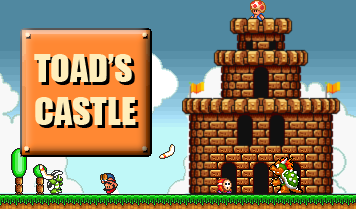 Toad, who was quickly moving up in status, had been assigned to guard the Kingdom’s sixth castle. Bowser sent seven minions out to hunt down the princess. When Toad refused to disclose her location, he was captured and imprisoned in the very castle he was supposed to be guarding. Days passed and finally Toad was rescued by Mario. Toad never forgot Mario for what he did. He came along with Mario on his next quest, and continues to offer help by providing Mario with items and advise to this day. In his free time Toad enjoys playing games with Mario and his friends, but he still doesn’t understand why Bowser gets invited.